Photolalia: Stand And Deliver -- Some images... and a few brief words about them. 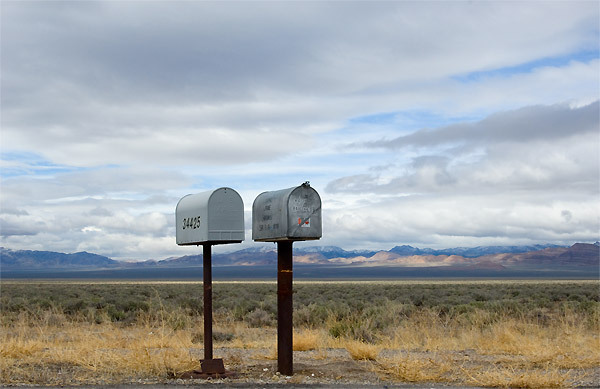 (Central Nevada, 2007. Image copyright Hamish Reid. Click on image above for larger version).
. My kind of road, I guess; I've driven it from Ely, NV, to Bishop, CA several times in the last fifteen years, always in the winter, and always in no hurry at all. And somewhere halfway between Ely and Tonopah, there they were, in the middle of nowhere, no signs of houses or properties visible near the highway, and just the sagebrush and dirt tracks leading off across the plains towards the mountains. It was a striking image in real life; it's not quite so striking here or when printed, mostly because you really can't see that there's just nothing around these boxes, just a long straight highway and what looks like thousands of square miles of sagebrush. But even so, it's still a pretty evocative sight, and has that American Mythic West feel to it, both physically and culturally. The clouds also make this image as well, of course  it could have just been one of those gorgeously boring endless blue skies, but then there'd be no real texture there to contrast with the sagebrush and mountains, and no hint of past or future storms (and note that the sagebrush is deceptively green here due to recent rain  it's desert in reality, though, something you don't forget if you drive through here in summer). And I can't help wondering if the next time I drive past here, there'll be a whole cluster of boxes, and it'll be obvious where the associated houses and settlements are. It might be in the middle of nowhere for someone like me, but that's no impediment for developers, is it? Photolalia: Some images... and a few brief words about them. (Like Dancing About Architecture). Site feeds: [RSS] and / or [Atom]. Hamish Reid is a photographer, designer, and software engineer living and working in the Jingletown district of Oakland, California. This is his full Blogger.com profile. You can get hold of Hamish at xyzphotolalia at ylayalixyz dot com without the xyx's. Photolalia is part of the Ylayali complex. All images and text on Photolalia are Copyright Hamish Reid unless otherwise specifically noted.